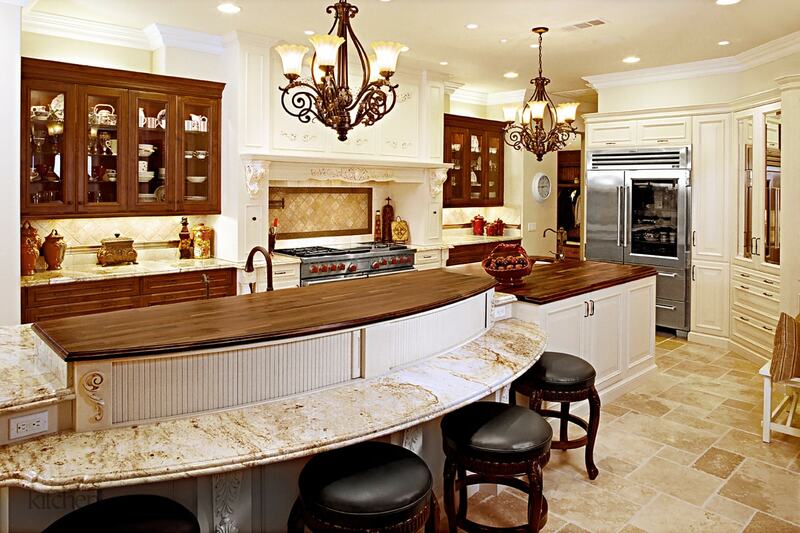 Mediterranean Charm in Yorba Linda | Le Gourmet Kitchen Ltd. This traditional kitchen design in Yorba Linda evokes a Mediterranean charm with unique features and a warm color scheme that will make it the center of attention in this home. The kitchen remodeling project involved structural changes to create the design this family wanted. The original kitchen was opened up into the family room, and a structural sheer wall was removed so that the space could be made larger and the layout open plan. The structural revisions included installing a steel beam with posts. 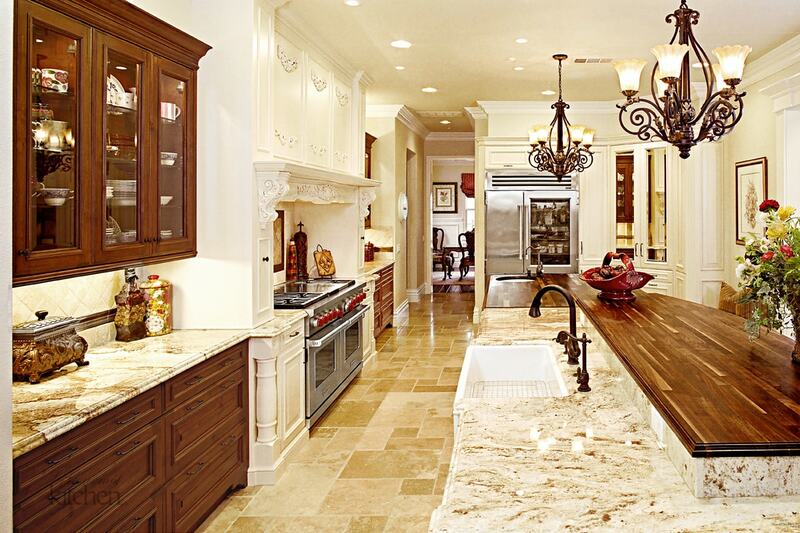 The resulting space created the perfect spot for cooking, entertaining, and much more. 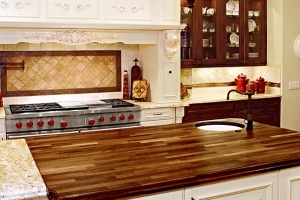 Custom dual-toned kitchen cabinets from Bentwood Kitchens and Woodmode give the room a stunning, classic appearance. 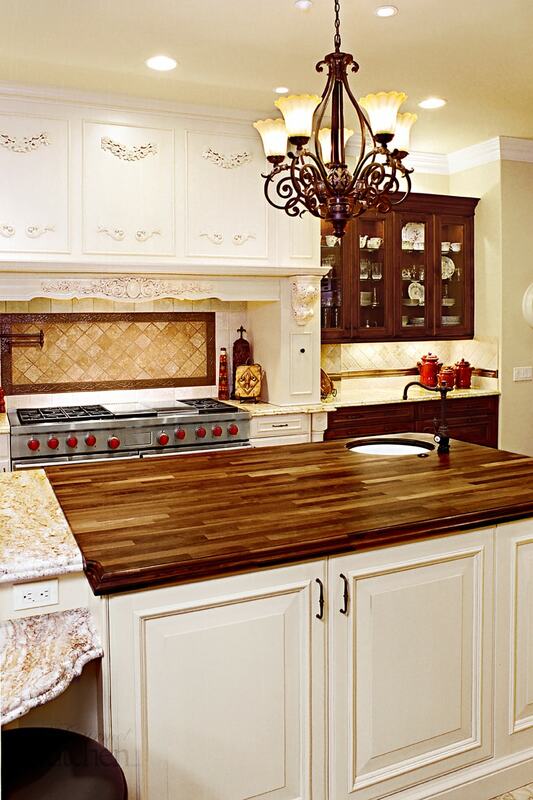 Light colored, distressed finish cabinetry was used in the island with a Grothouse walnut wood countertop. This cabinetry was also installed around the oven, the custom built-in Vent-a-Hood wood hood, and as part of the perimeter cabinets. This is contrasted by dark wood finish cabinetry on either side of the cooking area, which incorporates glass front upper cabinets. These cabinets are complemented by a beige-toned multi-colored granite countertop, which is also used on the island for an elevated counter, perfect for a breakfast bar or a casual glass of wine. The island also incorporates tambour doors at the island seating area. Enkeboll custom carvings are included throughout this area, such as in turning on the legs and crown molding, giving the room a one-of-a-kind appearance. The island includes both a central Shaw farmhouse sinks and a Rohl Shaw second sink, complemented by a Grohe faucet. The large Wolf range will help bring any culinary masterpiece to life, and a Miele dishwasher is ideal for clean-up. The Sub-Zero pro-48 refrigerator is a stunning glass-front model that brings both top of the line functionality and style to this Yorba Linda kitchen design. A beige limestone Versailles floor pulls together the color scheme and adds to the warm charm of this kitchen.